World Soil Day was organized today i.e. 5.12.2017 in one of the KVK adopted villages : Nagireddipalli, Nawabpet Mandal. Honorable MLA Sh. K. Yadaiah, Chevella Assembly Constituency participated in the programme along with other local representatives, government officials, NGOs and 188 farmers and Farm women. Expert lecture by Dr. K. Srinivas, Pr. Scientist(Soil Science) CRIDA was arranged on soil health and nutrient management, soil test based recommendations tp farmers. Dr. V. Maruthi, Pr. Scientist and Head, KVK briefed the importance of world soil day to farmers. Dr. SM Vidya Sekhar, CTO and SMS , KVK explained the status of soil fertility and nutrients, G. Srikrishna, D. Sudheer, A. Vidyaadhari SMS spoke on the ocassion. 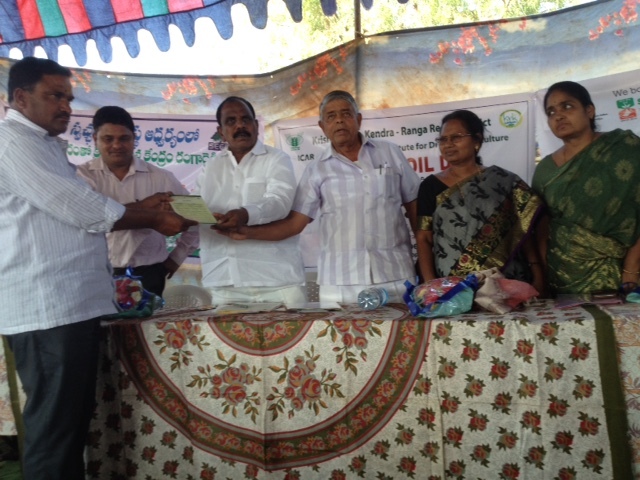 Hon'ble MLA distributed few soil health cards to farmers from 4 villages.Pledge on Soil Day was also taken. Video message was displayed. A total of 300 soil health cards were distributed today. Exhibits on soil testing kit, biofertilzers,fodder arranged.